We affirmed the consultation that had taken place in preparation for the meeting by Archbishop Welby and commended his approach for future events within the Communion. [Evidently, Welby’s consultative style was well received. This is borne out by comments of some of the Primates after the meeting, comparing the spirit of this meeting with earlier ones]. The Primates supported the Archbishop of Canterbury in his proposal to call a Lambeth Conference in 2020. [A very important statement. After Lambeth 2008, there were a lot of rumblings that there might not be another, at least not in our lifetime, because of the frustration at the way the previous Lambeth was structured. Here again, the appreciation for Welby’s style may be showing through. Trust enough was built to allow for agreement to come together again in this way]. Primates discussed tribalism, ethnicity, nationalism and patronage networks, and the deep evil of corruption. They reflected that these issues become inextricably connected to war and violence, and derive from poverty. They agreed to ask the Secretary General of the Anglican Communion to commission a study for the next Primates’ meeting. The Primates agreed to meet again in 2017 and 2019. [Once again, important topics, but the agreement of the primates to meet together, not once, but twice, is particularly important]. It is our unanimous desire to walk together. However given the seriousness of these matters we formally acknowledge this distance by requiring that for a period of three years TEC no longer represent us on ecumenical and interfaith bodies, should not be appointed or elected to an internal standing committee and that while participating in the internal bodies of the Anglican Communion, they will not take part in decision making on any issues pertaining to doctrine or polity. We have asked the ABC to appoint a Task Group to maintain conversation among ourselves with the intention of restoration of relationship, the rebuilding of mutual trust, healing the legacy of hurt, recognising the extent of our commonality and exploring our deep differences, ensuring they are held between us in the love and grace of Christ. 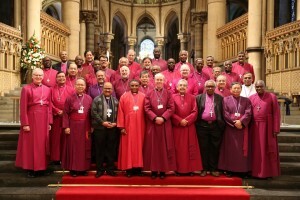 Primates of the Anglican Communion at Canterbury Cathedral, 14 January 2016.